Congratulations to Jordan, who came at Australia with a game plan and executed it to perfection in their 1-0 win over the Socceroos last night. Not exactly an ideal start to an Asian Cup title defence, was it? The Jordanians pulled off a classic piece of tournament football, stacking their defence, running down the clock at every opportunity and stunning the Socceroos with an expertly taken set-piece goal. It means Australia have now lost a group stage game in three of their four Asian Cup appearances to date. And while the chance to avoid Japan in the quarter-finals might be a blessing in disguise, the Socceroos won’t even reach the knock-out stage if they play like they did last night against Palestine and Syria. It had shades of the 2007 Asian Cup all over it, with the nervy team display littered with questionable decision-making and some poor individual performances. Forget the refereeing – which didn’t help, but was the same for both teams – there seemed to be a few key issues that Graham Arnold needs to sort out. 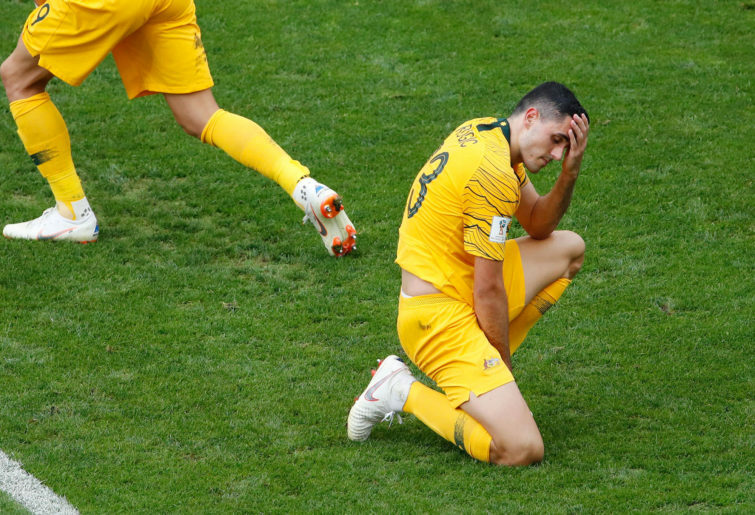 Namely what to do with Tom Rogic, whether to rejig the front third and how better to apply some game management to Australia’s tournament football. Has there been a more Jekyll and Hyde type of player to pull on a Socceroos jersey of late than Tom Rogic? At times he resembles a world-beater at Celtic, but he can’t even beat the first defender with the Socceroos. He was woeful last night, and if we wondered if he could ever play effectively alongside Aaron Mooy, we learned last night that he can barely play without him. It’s never nice to single out individuals for criticism – and with Arnold unlikely to ring in mass changes, Rogic will probably receive a stay of execution – but the so-called playmaker needs to actually do some playmaking against Palestine. As for the rest? Rhyan Grant is a better option than Josh Risdon at right back thanks to his marauding raids forward, Chris Ikonomidis must start against the Palestinians, and Awer Mabil looks by far Australia’s biggest goal-scoring threat. Where does that leave Jamie Maclaren? Probably not in the starting side next time out, you’d imagine. You had to feel sorry for the Hibernian striker when he had what appeared to be the equaliser chalked off for straying marginally offside, but while Maclaren is a serviceable goal poacher, there are very few other strings to his game. Arnold will be praying Andrew Nabbout is fit enough to start against Palestine, but if he’s not, it might be worth playing Ikonomidis at the point of the attack. It might also be worth Arnold instructing his players to have a think about some better game management strategies as well. Jordan’s goal through Anas Bani Yaseen’s towering header from a well-worked short corner routine came with three Australian players strung out in a line across the six-yard box, marking thin air. Here’s a thought – how about stationing one of those players on the near post? Maybe that way, instead of standing and staring in disbelief as the winning goal flashes in, one of those players could have cleared it instead? But the slavish adherence to zonal marking isn’t even the most frustrating part of Australia’s game. It’s the inability to clear the first defender from corners. It’s the tendency to turn backwards into trouble. It’s the unwillingness to take responsibility in front of goal, faffing about with a series of fruitless passes before unleashing a speculative effort that flashes high and wide. Some of the Socceroos’ decision-making leaves an awful lot to be desired. It’s up to Arnold and skipper Mark Milligan to sharpen those instincts ahead of Friday’s clash with minnows Palestine. Nothing less than drastic improvement will mean a swift end to Australia’s Asian Cup title defence. On the basis of last night’s performance, that’s just about what the Socceroos deserve.